Founded in 1964, is one of the oldest, largest and most respected cultural exchange organisations in the world. Camp America were established through AIFS in 1969. Founded in 1964, the American Institute For Foreign Study (AIFS) is one of the oldest, largest and most respected cultural exchange organisations in the world. Camp America were established through AIFS in 1969. AIFS have global offices in 6 different countries; America, UK, Germany, Poland, Australia and South Africa. They organise various cultural exchange programmes for more than 50,000 participants each year - Camp America being one of those. Since 1964 AIFS has been committed to cross-cultural exchange under the the direction of founder and Chairman Sir Cyril Taylor. AIFS continues to operate its family of services, today, as a social enterprise. AIFS are a for-profit organisation and maintain a double bottom line: financial results and social outcomes. This structure ensures that AIFS have the resources to find new and innovative ways to pursue their core vision of bringing the world together. 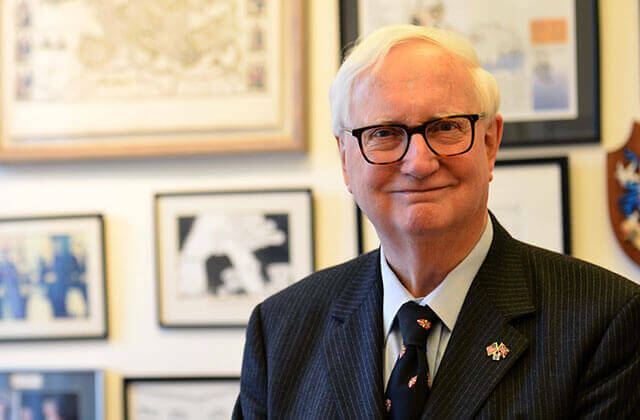 Born in Yorkshire, Sir Cyril Taylor is the founder and Chairman of AIFS and has a long and distinguished career in Public Service and Education. A former military service member with the King's African Rifles in Kenya, he graduated from Cambridge University with a honours degree in history. After graduating Cambridge, Sir Cyril then went on to pursue an MBA at Harvard Business School for which he was awarded the Charles Bell Scholarship by the London Chamber of Commerce. After spending time at Harvard and then working for Procter & Gamble in Cicinnati he realised there was a gap in the market for language teachers looking to take students abroad and initially in Europe. This then led to the formation of AIFS in 1964 and over 50 years later he continues to serve as Chairmen. Sir Cyril passed away in London in January 2018 at the age of 82. The vision of AIFS reads 'We bring the world together' and their mission is to 'provide the highest quality education and cultural exchange programs to enrich the lives of young people throughout the world. Values that AIFS are committed to are; excellence in programs, operations and people, respect and understanding of different cultures, exceptional caring support for their program participants to ensure their safety and well being, to be honest, equitable and non-discriminatroy towards program participants, partners and employees, technological innovation, teamwork and collaboration both within the organisation and with partners, encouragement of employee initiative and professional development and finally responsible financial stewardship. Since it was established, AIFS has expanded its programme offerings to include the study abroad College division, Au Pair in America, Academic Year in America, Summer Institute for the Gifted, Cultural Insurance Services International as well as summer work travel programmes in Australia & New Zealand and of course, Camp America. As well as these programmes, in 1972 AIFS also founded Richmond, The American International University in London. Richmond is now a free-standing non profit American University accredited by both the US and UK education authorities to award both US and UK degrees.